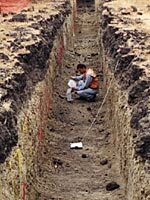 Earth Focus Geological Services, Inc., is a small, professional engineering geology and hydrogeology consulting service company. Founded in Los Angeles in 1995, we have since relocated to the San Francisco Bay area to historic Niles (Fremont). We perform work in and around the San Francisco Bay area and throughout the State to serve our clients, consistently striving to exceed the current standards of care for the engineering geologic profession in California. Earth Focus provides a wide range of geology services for residential and commercial construction, land development and planning projects, telecommunication facilities, stream restoration and stream bank repair projects, and transportation corridors. Our clients include geotechnical engineers (soils engineers), structural engineers, surveyors, construction engineering firms, architects, attorneys, land planners, homeowners associations, individual homebuyers, and other geologists. Patrick L. Drumm is the founder and president of Earth Focus Geological Services. He has over 15 years of experience in the engineering geologic and hydrogeologic consulting profession evaluating geologic hazards, such as landslides and faults, for construction and land development projects throughout California. Mr. Drumm is a California Registered Geologist (RG), a California Certified Engineering Geologist (CEG), and a California Certified Hydrogeologist (CHG).